Tickets are available online or you can purchase them in the restaurant gift shop. TICKETS PURCHASED BEFORE MAY 4TH WILL BE MAILED TO THE ADDRESS YOU PROVIDE. 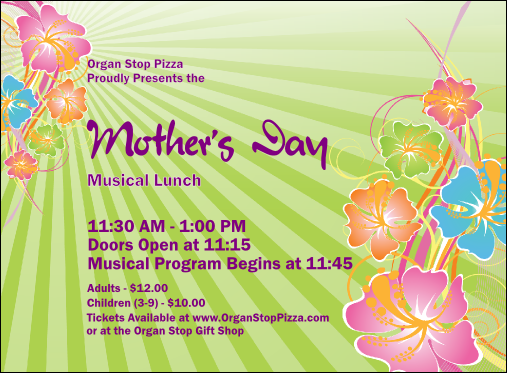 ALL TICKETS PURCHASED ON OR AFTER SUNDAY MAY 5TH WILL BE HELD AT THE ORGAN STOP PIZZA GIFT SHOP FOR PICK UP THE DAY OF THE EVENT. Our full “Regular” food menu (appetizers, pasta, etc.) WILL NOT be available. To streamline and serve a large group quickly, special orders WILL NOT be available. Because of this and the special handling process, Gluten-Free Pizzas WILL NOT be available. Beer, Wine and Ice Cream will be available for a la carte purchase. BUY YOUR TICKETS EARLY AS THIS EVENT SELLS OUT EVERY YEAR!